The Basket Monster Strikes Again! AAAAAGH! The Basket Monster is chasing me around the house! I ran around the kitchen island in circles before dashing through the living room, the Basket Monster hot on my heels…. 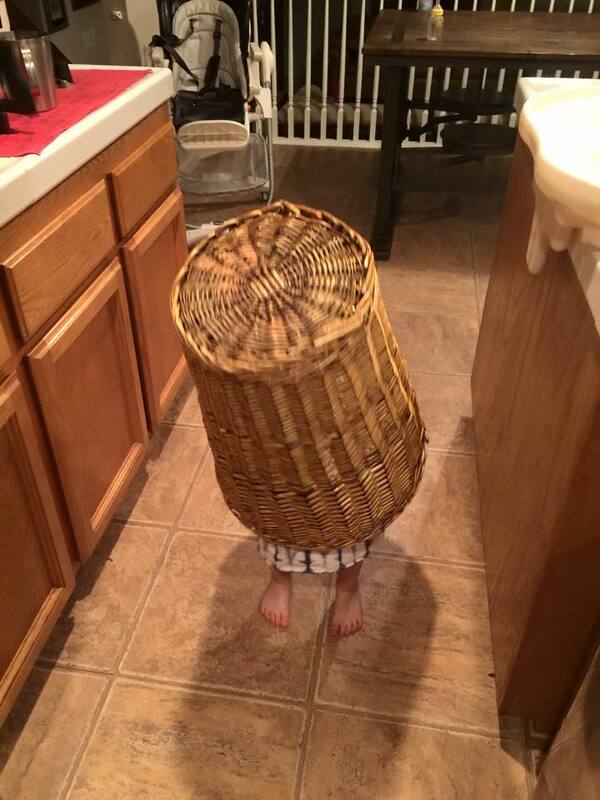 I escaped to the bathroom and thought I was safe, but the Basket Monster walked in, flickered the lights off and on and started shrieking, horror-movie style. Oh no! But before I got TOO scared, my three-year-old flipped the lights back on and started giggling. “It’s just me, mommy!” Brontë said. Lately, Brontë has been consumed with monsters. Monsters haunt her dreams and hide in her closet. We had to start performing nightly monster checks while administering No-Monster spray in her room before she could go to sleep. She insists her closet be COMPLETELY SHUT before I leave the room. Monsters might slip through the cracks. You never know. Because monsters wreak all manner of havoc, and sometimes adults cover it up. Brontë (noticing the bandaid on my arm after a blood test): MOMMY! You hurt? What happened? Me: It’s okay. I just had a blood test. Brontë (sighing knowingly while patting my shoulder): Monsters? Me: No, not monsters. The doctor. Brontë (thinking I’m clearly feeding her a line of crap): Monsters. NOT Doctor Stuffins? Brontë (patting me gently while refusing to indulge my fictions): It’s okay mommy. Monsters gone now. Perhaps to deal with her monster angst, Brontë has begun playing the monster herself. We usually go grocery shopping on Sunday, and she likes the cart with the car attached to the front. Some people found toddler-monster-ambush hilarious, chuckling as they walked ahead, while others looked at Mommy like she had clearly lost her mind, allowing that much willful irreverence in a grocery store. Either way, it sure amused Mommy. And when we went home, Brontë donned the Laundry Basket. NextWon Second Place in the Six Word Story Challenge!